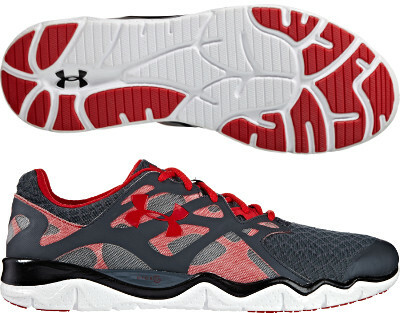 Under Armour Micro G Monza are neutral performance running shoes. The aggresive Under Armour Micro G Monza is a responsive running shoe close to racing flat but with much more cushioning, perfect choice for speed workouts and mid/long distance racing. Its name comes from the combination of the midsole foam (Micro G) with the name of the city in north Italy (Monza) which has the motor racing circuit where fastest lap in an Formula 1 car has ever been recorded. Always worth to mention the high quality (manufacturing process, materials) coming from Baltimore's brand. Upper from Micro G Monza is multilayer based on a grid that builds the flexible structure that will adapt to different scenarios and provide enough consistency. On top of it there are different elements to provide improved support: reinforced welded toe cap and singular synthetic skeleton featuring enhanced snug fit. Besides upper, most interesting part of the Micro G Monza is the midsole. Just one piece of Micro G, a lightweight foam with outstanding blend of cushioning and responsiveness. Top flanges from midosle present a wave design for better flexibility looking for smoother transition. Although full length contact outsole has been upgraded with harder rubber in more exposed areas for better grip, it raises several concerns about durability.